The last week of December started so well at Delgatie Castle Trout Fishery then ground to a complete halt on Christmas Day when ice appeared for the first time this year. The water remained iced over since but temperatures eventually increased in order to allow fishing over the New Year holiday period. Updates for conditions can be obtained daily from 8am by phoning Bob on 07980 999 006. .J Abel, Fraserburgh (20 fish, blobs); A. Murray, Gardenstown (14 fish, black/white cat’s whiskers); K. Maddocks, Aberdeen (14 fish, pink bunny leech); A. Caithness, Dunfermilne (12 fish, green/black fritz); B. Wiseman, Fraserburgh (11 fish, pink fritz); J. Clayton, King Edward, (11 fish, WSW). A. Caithness, although a junior angler, has the promise to be listed among the seniors. Well done! 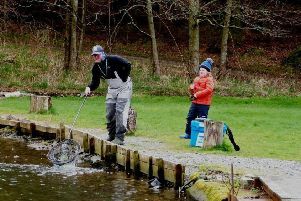 Delgatie Castle is a Troutmaster water and is open seven days from 8am til dusk. Boats (where required), rods and tackle is available for hire at the fishery. For up-to-date conditions phone Bob on 07980 999 006.